The prisoners were brought out of the gaol about two in the afternoon of Thursday, the 19th of January, 1748-9, being the day after receiving sentence, when a company of Foot Guards and a party of Dragoons were drawn out ready to receive them, and to conduct them to the place of execution, which was about a mile out of the town. The procession was solemn and slow; and when they came to the tree, they all, except the two Mills’s, behaved a little more serious than they had done before. they were all guilty, as charged in the indictments; and lamented the case of his wife and children, and said he hoped others would take warning by his untimely end. The Mills’s, as I observed before, seemed no ways concerned; and the young one said he did not value to die, for he was prepared, though at the same time he appeared so very hardened and abandoned. the face, but did not care to repeat any of the cruelties he had exercised. We are now come to the conclusion of the trials, and the behaviour of those who were executed at Chichester, and shall next proceed to those that were brought on at the assizes at East Grinstead, where two of the same gang were tried for murder, namely, Sheerman for that of Galley, and John Mills, called Smoker, for that of Hawkins, who was destroyed in as cruel and barbarous a manner as either Galley or Chater. After which we shall give an account of the trials of the other smugglers, which were very remarkable for the most notorious crimes with which they are charged, such as murder, housebreaking, robberies on the highway, &c. But as Sheerman was tried for the crime for which several others had been already convicted, as has before been related, we think this trial will most properly follow those of his confederates, and with whom he had been concerned throughout the whole course of their villainies. After which will follow the trial of John Mills, who not only had a hand in the murder of Chater, but likewise was a principal in that of poor Hawkins. whipped, beat and bruised him, by the means of which he fell off the second time; and being set on another horse, the said prisoner, with the others, again beat and whipped him, till the said Galley was so terribly bruised and wounded that, being ready to fall off the horse, the prisoner gave him him a push, and threw him to the ground, of which blows, wounds and bruises, and fall from the said horse, he died. The counsel for the King upon this indictment were the same as were upon that against John Mills and John Reynolds, who after laying open and explaining to the court and jury the heinous nature of the offence and the pernicious consequences of smuggling, which generally brought on murder, robbery and other enormous crimes, they produced the following witnesses in support of the charge against the prisoner. Mr. Shearer, collector of the customs at Southampton, deposed that he received a letter from the commissioners of the customs, informing him that one John Dimer was taken up on suspicion of being concerned with others in breaking open the custom-house at Poole and committed to Chichester gaol; that thereupon he sent one Chater with a letter to Justice Battine under the care of the deceased William Galley, the 14th day of February was twelvemonth, and hired a grey horse for him to ride on. trimmed with blue, his waistcoat and breeches the same, and rode upon a grey horse, and that he never saw his father afterwards. George Austen deposed that on the 14th of February was twelvemonth, being at the New Inn at Leigh, he saw the deceased William Galley and another person on horseback, and hearing them enquire the way to East Harden, and shewing a letter they had for Justice Battine, he said that he and his brother, Thomas Austin, and his brother-in-law, Robert Jenkes, were going part of that road and would shew them the way; that he went with them to a place called Rowland’s Castle, to a public house kept by one widow Payne; that being there Galley and his companion called for rum. That the widow Payne enquired of him if he was acquainted with these men, or whether they belonged to his company. He told her they were going to Justice Battine’s; upon which she apprehended there was something in hand against the smugglers, several of whom came in soon afterwards. upon which they consulted together what to do with Galley and Chater, and it was agreed by them all to carry them to a place of security, till they should have an opportunity of sending them to France; and that the prisoner was present at this consultation. Scardefield’s with Chater, to Old Mills’s, where he was left to the care of the prisoner, and in the meantime they buried Galley. Then William Scardefield was sworn, who deposed that the prisoner at the bar was with the rest of the smugglers at his house at Rake, when Galley was brought dead there, bat went away with Chater, the other man who was all bloody. The counsel for the King said they had a great many more witnesses, but they would rest the matter as it now was, and not give the court any further trouble. The prisoner, being called upon to make his defence, said he had nobody to disprove the facts or speak to his character; and said he was sent for to Rowland’s Castle, though he did not know for what; that when he came there he was threatened by Jackson, Richards and others that were there, that they would shoot him through the head if he would not go with and assist them in what they were going about, and that it was not in his power to make his escape from them. The jury brought him in guilty. Death. Having now given the trial of Henry Sheerman, alias Little Harry, at East Grinstead, it will be necessary next to give an account of his life and behaviour under sentence of death, and at the place of execution, before we proceed to the trial of that notorious villain John Mills, alias Smoker, for the cruel murder of Richard Hawkins. of age, was born and bred up at West Strutton, in the county of Sussex, to husbandry, whose parents were people of good character, though of but middling circumstances; and gave him as good an education at school as they could afford; but he said he never minded his learning his mind run more upon other things, so that he made but very little progress, though he could read very well and write a little. He said that Jackson was the cause of his ruin, and the considerable gains that were allowed to those who were as servants to the master smugglers, seduced him to leave his honest employment and take on with them. he was safe during his confinement there, and often told Chater that he was a villain to turn informer, and he would see he should be hanged to prevent his informing any more; and he declared, that when they took Chater from Old Mills’s house, that Old Mills knew that they were going to hang him at the well by Lady Holt Park, and that the resolution and agreement of him, Old Mills, as well as the rest, was to fling his body down there, it being a dry well, to prevent a discovery, and that Old Mills himself said it was a very proper place, for as it was a dry well, it might lie there an age before anything could be discovered, and before that time it would be rotted quite away to nothing. Before we proceed any further, we shall inform the reader what encouragement is given to seduce the young people from their honest employments to turn smugglers, which Little Harry declared. withstand; and which has been the cause of so many turning smugglers. He said it was very hard work in going down to the sea-side to fetch the goods, and considering the hazard they run if taken, and of their own persons, as they are obliged to ride in the night only, and through the byeways, avoiding all the public roads as much as possible, people would not take on with them if it were not for the great profits that arise. never proposed by any of them to hurt either Galley or Chater, but to keep them privately to prevent their giving the designed information, till the women, Carter’s and Jackson’s wives, proposed hanging them; and then it was talked of carrying them to the well just by, and to hang them and fling them down it, but it was not agreed to; neither did any of the men in his presence or hearing shew or intimate any inclination towards their so doing. He said further, that they all drank pretty freely to make Galley and Chater drunk, and when they came to the resolution of carrying them both away, and concealing them till they knew what would be the fate of the shepherd Dimer, they were all more than half drunk; that he verily believed none of them had any design of murdering them while they were at Rowland’s Castle; but Jackson, who was the drunkest of the company, called out to whip them, which was soon after they set out from Mrs. Payne’s house, when Edmund Richards, who is not yet taken, began to lash them with his long whip; and then they all did the same except Steel, who was leading the horse the two men rode on. He said that the design of tying their legs under the horse’s belly was for no other reason than to prevent their jumping off and running away, and making their escape, as it was night time; which, if either of them should do, they would be all inevitably ruined. The liquor they had drank, and giving way to their passion, urged them on to the cruelties they exercised on Chater; but when they found Galley was dead, it sobered them all very much, and they were all in a great consternation and surprise, and could not tell what to do, when they concluded to bury the body of Galley, and to take care of Chater. He lamented the unhappy case of Chater during the time of his being chained in Old Mills’s turf-house, but said, self-preservation obliged him to take care he did not get away, though he was all the time very uneasy, and said he declared his abhorrence to Tapner’s cutting Chater across the face and eyes, and of Cobby’s kicking him while he was saying the Lord’s Prayer, and that he came out of the turf-house into the dwelling-house upon that account, not being able to bear hearing the poor man’s expressions in begging for a few hours or minutes to make his peace with his Creator, at the same time the blood running all down his face. He said it was not Cobby alone that kicked Chater while he was at prayers, but also Richards and Stringer, who are both not yet taken. Being asked why he did not give poor Galley and Chater a dram, as well as the smugglers, when they all got off their horses; he said he was going to do it, but Richards, Carter and Jackson, all swore they would blow his brains out if he did. He acknowledged going away with them from Old Mills’s in order to hang Chater according to agreement; but seeing Tapner whip the poor man so cruelly, Chater at the same time being all over blood and wounds, his heart relented, and that was the only reason why he did not go with them, and be present at his murder. At his trial he behaved with reservedness, but no way audacious, as some of the others were; and after he had received his sentence, he began to bemoan his unhappy circumstances, and prayed very devoutly; and confessed that he had been a very wicked liver ever since he turned smuggler. him the most uneasiness was, the great scandal and vexation he had brought on his wife and family. He was conveyed under a strong guard of soldiers from Horsham to Bake, near the place where Galley was buried, on the 20th day of March, 1749, and there executed, and afterwards hung in chains, as an example. At the place of execution he behaved very penitent, and as became one in his unhappy circumstances, frequently saying that Jackson was the original person who was the cause of his ruin, and that he should not have gone to the widow Payne’s that unfortunate day that Mr. Galley and Mr. Chater were there, had he not been sent for. He declared that at the time he gave Galley the push off the horse, when Galley fell down and died, he had no thought that that fall would kill him just then; that he begged pardon of God and man, not only for that wicked action of his life, but for all others; and then was turned off, crying to the Lord Jesus Christ to receive his soul. We shall now proceed to the trials of John Mills, alias Smoker, John Reynolds, the master of the Dog and Partridge on Slindon Common, where Richard Hawkins was inhumanly murdered; and then give an account of John Mills’s wicked life, and behaviour at his trial, and under sentence of death; and also of his confession, and last dying words at the place of execution. kicking, him, the said Richard Hawkins, over the face, head, arms, belly, and private parts: of which wounds, bruises, kicks and stripes he instantly died. And John Reynolds was indicted for aiding, assisting, comforting and abetting the said John Mills, alias Smoker, and Jeremiah Curtis, alias Butler, alias Pollard, and Richard Rowland, alias Robb (both not yet taken), in the murder of the said Richard Hawkins. The counsel for the King were Mr. Staples, Mr. Steele, recorder of Chichester, Mr. Burrel, Mr. Smythe (one of the king’s counsel, learned in the law, and member of Parliament for East Grinstead, in the county of Sussex), and Mr. Serjeant Wynn. the laws of the land, but against the law of God also, which commands all men to render to Caesar the things that are Caesar’s. That smuggling was robbing the nation of that revenue which is appointed for payment of the national debt; and that every act of smuggling was defrauding every one of his Majesty’s subjects that pay taxes, as they are obliged to make good all deficiencies. That when they shall hear the witnesses they will find that this evil practice was the original cause of this murder, and then he did not doubt but they would find the prisoners guilty. not get it, he would come sword in hand, and find it out and take it away. Being asked by the court if the prisoner Mills was one of them that were with Curtis, said he could not tell. Henry Titcomb deposed that one day in January last was twelvemonth, Curtis and Mills came to Mr. Boniface’s barn, where he, the prisoner, and Richard Hawkins (the deceased) were at work; that Curtis called Hawkins out to speak with him; that he did not hear what passed between them, but that Hawkins went away with them; that a little while after, the same afternoon, he saw Hawkins riding behind Mills from Walberton towards Slindon, and never saw Hawkins the deceased afterwards. John Saxby deposed that he was a servant to Cockrel the elder, of Walberton; that the day Hawkins (the deceased) was missing, Curtis, Mills, and Hawkins came to his master’s house and drank together; that at going away, Mills bid Hawkins get up behind him, which he at first refused, saying he would not, without making a sure bargain; that they bid him get up for they would satisfy him, which Hawkins did; and this deponent never saw the deceased afterwards. they saw his private parts; then they took aim thereat, and whipped him so that he roared out most grievously; that then they kicked him over the private parts and belly; they in the intervals asking after the tea; the deceased mentioned his father and brother, meaning the two Cockrels; that upon this Curtis and Mills took their horses, and said they would go and fetch them, and rode away, leaving the deceased with Robb and this deponent. That after they were gone, he and Robb placed the deceased in a chair by the fire, where he died. fetch them. That they rode all together to the prisoner Reynolds’s house, when Reynolds said to Curtis, “You have ruined me,” and Curtis replied he would make him amends. That then they consulted what to do with the body, when it was proposed to throw him into the well in Mr. Kemp’s park, and give out that they had carried him to France; that the prisoner Reynolds objected to it, as that was too near, and would soon be found. That they laid him on a horse and carried him to Parham Park, about twelve miles from Slindon Common, where they tied large stones to him in order to sink the body, and threw him into a pond belonging to Sir Cecil Bishop. John Cockrel the younger deposed that the 28th day of January last was twelvemonth, about ten o’clock at night the prisoner Mills came to his house, called for some ale, ordered his horse into the stable; that while he was in the stable Curtis came in, and demanded two bags of tea, which he said his brother- in-law had confessed he had got; that this deponent denied his having them, upon which Curtis beat him with an oak stick till he was tired; that after this they took him with them to his father’s at Walberton, where they took his father and him with them, to carry them to Slindon, on Mills’s and Curtis’s horses, one behind each, and about a mile before they came to Slindon, they met two men on horseback, who called to them, and said they wanted to talk with them; that then they were ordered to get off from behind Curtis and and Mills; that after the two men had talked with Curtis and Mills some time, Curtis bid them go home, and when they wanted them they would fetch them. John Cockrel the elder, being sworn, confirmed the evidence as to being carried away, and afterwards let go. Being asked by the court how long after his son-in- law (the deceased) was missing it was before he heard his body was found, said that in the April following he was sent for to Sir Cecil Bishop’s; that there he saw the deceased Richard Hawkins mangled in a most terrible manner, having a hole in his skull; that he knew him by the finger next the little finger of his right hand being bent down to his hand. Matthew Smith deposed that one night in January last was twelvemonth, he was at the prisoner Reynolds’s house, the Dog and Partridge, on Slindon Common, and saw Curtis and Mills ride up to the door (Mills with a man behind him), and Curtis called out to Robb, and said, “We have got a prisoner”; and that then they all went in together into the back parlour. Richard Seagrave, another witness, deposed that he lived at Sir Cecil Bishop’s in Parham Park, and saw the body of a man taken out of a pond there, very much mangled and bruised; and was likewise present when John Cockrel the elder came there and said he knew the body to be that of his son-in-law, Richard Hawkins. Common, where Robb and Winter, commonly called the Coachman, were before them; that he and Robb whipped Hawkins with their horse-whips till he owned that the Cockrels had their tea; that then he and Curtis went and fetched the Cockrels. and as they were bringing them behind them on the road, Robb and Winter met them and told them that the man was dead whom they had whipped; that they then sent the Cockrels home and went and took Hawkins’ dead body and -carried it to Parham Park and threw it into Sir Cecil Bishop’s pond. Here the counsel for the King rested it. The prisoner being called upon to make his defence, denied the murder, and said he left the deceased Richard Hawkins alive and well with Robb and Winter, when he and Curtis went to fetch the Cockrels, and how Hawkins came by his death he could not tell. This was Mills’s defence. The counsel for the prisoner Reynolds objected to the indictment, and said, though it might be extremely right with regard to the prisoner Mills, yet it was not so with regard to the prisoner Reynolds; for as Reynolds was indicted as a principal in the second degree, he should be concluded in the judgment as all principals are in murder. The court said this was a matter that might be offered in arrest of judgment, but not at that time. The counsel, in his defence, said the prisoner Reynolds was no ways privy to or concerned in the said murder; that the persons who brought Hawkins to his house were in a room by themselves, and what they did there was without the privity or knowledge of the prisoner Reynolds, and that they should call witnesses to prove the same. William Bullmar was called, who deposed that one day in January last was twelvemonth, he was at the prisoner Reynold’s house with William Rowe in the kitchen; that he saw Curtis in the house, and heard there were other people with him in the new back parlour; that himself was there till twelve o’clock at night, and that the prisoner Reynolds was with him during all that time, excepting when he went to draw beer for his customers in the kitchen. William Rowe deposed that he was -at the prisoner Reynolds’s house at the same time as the before-mentioned witness, that he saw Curtis and Mills in the house, and heard there were other people with them in the back room; that he stayed till twelve o’clock at night, during which time the prisoner Reynolds was with him except when he was called to draw drink for company. Mills’s behaviour was very unbecoming one under his circumstances; but before we proceed to say anything more of this criminal, we will give the particulars of his being apprehended. The 31st January last, a proclamation was issued for the apprehending several notorious smugglers that were concerned in the murder of Richard Hawkins, of Yapton, naming this John Mills as one of them, promising his Majesty’s pardon to anyone who should apprehend or give information of any of the offenders, although such informer was an outlawed smuggler, provided he was not concerned in any murder, or in breaking open his Majesty’s warehouse at Poole. Now William Pring, who was a witness against the said Mills and the two Kemps, knowing himself to be an outlawed smuggler, yet not concerned in murder, nor in breaking open the warehouse at Poole, resolves, if possible, to get his own pardon by taking some of those offenders. To this purpose he applied to a great man in power, informing him that he knew Mills, and that if he could be assured of his own pardon, he would endeavour to take him, for he was pretty certain to find him either at Bristol or Bath, where he knew he was gone to sell some run goods. Being assured of his pardon he set out accordingly, and at Bristol unexpectedly found the two Kemps with him, whom he likewise knew as being notorious smugglers. They then began to talk about their affairs. Mills was in a proclamation for two murders, that of Chater and that of Hawkins. Thomas Kemp was advertised for breaking out of Newgate, and Lawrence Kemp was outlawed by proclamation, and both the Kemps were concerned in robbing one farmer Havendon. friend, offered his advice, by which he intended to inveigle them into the snare he had laid for them. He said, since they were all alike in such desperate circumstances without any hopes of mending their condition, he would have them go with him towards London, and to his house at Beckenham in Kent, and then consult together, to go and rob upon the highway, and break open houses in the same manner as Gregory’s gang used to do. Upon which they all agreed to come away together; and upon the road, amongst other talk, Mills owned that he was one of those who committed the murder of Hawkins, and both the Kemps confessed that they were concerned in robbing farmer Havendon, in the manner it was proved upon their trials. hangers, before he would submit. They then brought them all three to the county gaol for Surrey, where they found Robert Fuller and Jockey Brown in custody for smuggling; and knowing that they had been guilty of many robberies on the highway in Sussex, they applied to the government for a Habeas Corpus, to carry them all five down to the assizes at East Grinstead, where, though they were each tried only upon one indictment, yet there was another indictment for murder, besides two for robbery against Mills, another for a robbery against Fuller, and two other indictments against the two Kemps, besides a number of other prosecutors, who were ready at East Grinstead to lay indictments against them, if there had been occasion. John Mills, about 30 years of age, son of Richard Mills, of Trotton, lately executed at Chichester, was bred up to the business of a colt-breaker by his father. He said he had been a smuggler many years, and blamed Jeremiah Curtis, alias Pollard, who stands indicted for the same murder he was convicted of, and William Jackson, who was condemned at Chichester for the murders of Galley and Chater, as being the principal persons concerned in drawing him away from his honest employment. Young Mills acknowledged himself a very wicked liver; but complained of the witnesses, that is, such of them as had been smugglers and turned evidences, and said that they had acted contrary to the solemn oaths and engagements they had made and sworn to among themselves, and therefore wished they might all come to the same end, and be hanged like him, and dŽned afterwards. that he committed both murders in twenty days; that of Hawkins, for which he was condemned, was perpetrated on the 28th of January; and the other, that he was not tried for, which was the murder of Daniel Chater, he committed the 17th of the following month. It having been said, as soon as Mills was convicted, that the design of him and Curtis in fetching the two Cockrels, the father and brother-in-law of Hawkins, to the Dog and Partridge, was to serve them as they had done Hawkins; Mills being asked the question, at first seemed very sulky; but at last said, he believed that if Winter and Robb had not met them and told them that Hawkins was dead, they should have basted the Cockrels well, when they had got them there; so that in all probability their lives were preserved by Hawkins dying sooner than his murderers expected. Jeremiah Curtis, alias Pollard, is at Gravelines in France, and has entered himself into the corps of the Irish brigades; but Richard Rowland, alias Robb, he imagined for very good reasons, was not out of the kingdom; and indeed he was seen and spoken to on East Grinstead Common, which is near that town, the latter end of the month of January last. time, for they were upon other business; and that he and his said two companions committed three robberies that afternoon and evening, the nearest being upwards of twelve miles from Hind Heath: but he refused to name any particulars, declaring he thought he merited dŽation if he was to discover any thing, by means of which any of his companions might be apprehended and convicted. At the place of execution  he behaved himself much more sedate than he had done before, during the small time he lay under condemnation, and prayed very devoutly; as he did indeed all the way from the gaol to the place of execution, to which he was conveyed under a strong guard of soldiers. He owned the fact of the murder of Richard Hawkins for which he suffered; but said when he went away with Curtis to fetch the two Cockrels, he did not think the man was so near his death. He likewise acknowledged being present at the consultation at Scardefield’s, when it was agreed to murder Daniel Chater, the shoemaker, who was at that time confined in his father’s skilling or turf-house; and also that he was concerned with the two Kemps in going with crape over their faces, and robbing farmer Havendon, of Heathfield, in the county of Sussex. He was pressed hard to make an ingenuous confession of all the crimes he had been guilty of, but he refused; and said he would inform them how far he was concerned in anything that was known to the world already, but nothing else. King’s custom-house at Poole in Dorsetshire was broken open, he said he was, for it was too well known to deny it. 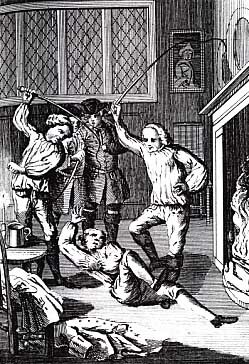 Just before he was turned off, he declared he was sorry for his ill-spent life, and desired all young people to take warning by his untimely end; and said that Richard Rowland, alias Robb, was only a servant to Curtis, and was ordered by Curtis to assist him in whipping poor Hawkins; for the cruelties of which and the murder of Chater, and all other wicked actions of his life, he hoped God would forgive him; declaring he died in peace with all mankind, and therefore hoped for forgiveness. This is the John Mills, since executed and hung in chains on Slindon Common, Sussex, for the murder of Richard Hawkins, and of whom we shall give a particular account. Notwithstanding James Reynolds was acquitted of the murder, yet as it appeared very plain that he concealed the murder, by knowing the same had been committed by the prisoner and the others who stand indicted for the same; as being present at the consultation for concealing the murder, and of burying the dead body, and advising therein, and his wife also being present, they are both indicted for the same, and are to be tried at the next assizes.